When I started this, as can be seen in the image at left, the case was two parts that fit together in a semi-complex manner (Actually, the very first version just had a little plastic square that covered the AVR, but nothing else). It was hard to print with any quality and, frankly, the front looked awful. 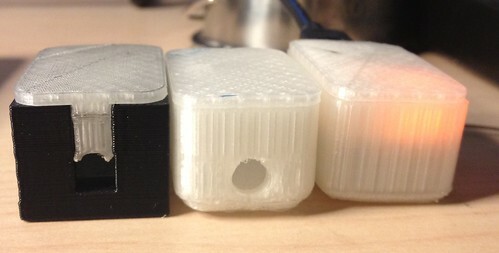 So I simplified it such that the IR LED could stick out a small hole, as seen in the middle. But then it dawned on my that the translucent plastics might just be transparent enough to IR that no hole was needed at all. And sure enough, it just worked! 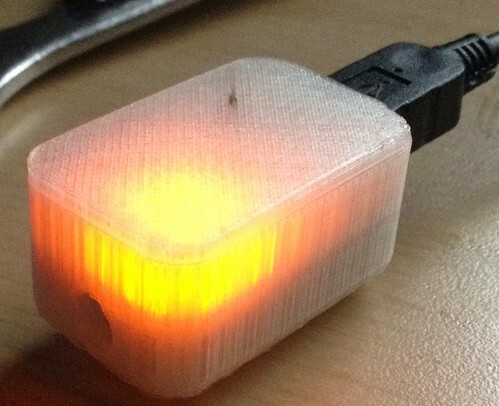 Thus, the design is now even simpler (assuming you have translucent filament). Both professionally and as a couch surfer, I’ve found myself interacting with a great deal of devices that can be controlled via infrared remotes. Often, remotes lost in the depths of a couch or misplaced in the fridge (it happens). Clearly, I needed an IR blaster that could be controlled from a computer to both eliminate the “losing the remote” problem and to integrate control of multiple devices into a single UI. Conveniently, Arduino micro-controllers with integrated USB ports are commonly available and quite cheap. Adding an IR LED to an Arduino is trivial, as the ever popular TV-B-Gone project demonstrates. This year, we decorated our eggs using Evil Mad Scientist Laboratories’ Egg-Bot. I picked up the kit from EMSL a few months ago. Roger and I put it together over a few evenings. Software installation is relatively easy (for an X11 app) and usage is quite easy. The assembly, no surprise for an EMSL kit, was a breeze, with a extremely well written and illustrated assembly manual. Seriously — EMSL kits are the best kits I have ever assembled! The Egg-Bot can draw on pretty much anything round that is smaller than a tennis ball; eggs of all types, light bulbs, golf balls, Christmas ornaments, and — even — fruit (I used a lemon for test purposes). The trick is finding a marking instrument that is appropriate to the target surface. 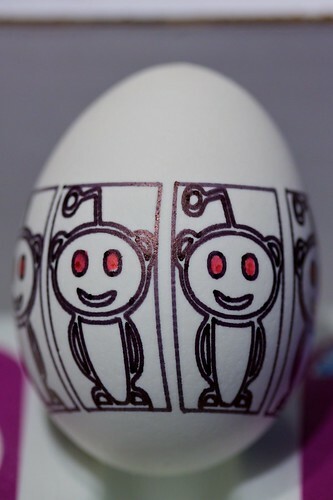 For eggs, Sharpies work quite well, but Bic Mark-It markers are too runny. Precisely, the Sharpie Ultra Fine Point Permanent Markers, 5 Colored Markers(37675) works very well. Regular Sharpies do not; too fat. However, EMSL has various accessories available, including an “extra wide” pen holder (ordering that very soon!). Air Mover: Why Didn’t I Get This Years Ago??!?! As we start into the second phase of remodel where we are living in the house, there is the occasion when there are stinky fumes from the work site that I want to keep out of the livable areas. Enter the Air Mover . Now that I have one, I’m stunned that I didn’t pick up one before! In particular, our climate is such that it can get really damned hot during the day and still cool off at night. Even with all the windows and doors open, the interior of the house can still take a bit to cool down. With the 1600CFM air mover pictured at left, I merely drop it on the picnic table outside our back door and put it on high. Within 20 minutes or so, the temperature inside the house is down to something quite comfortably cool. Better yet, our garage faces south west and, thus, gets baking hot by the end of the day and doesn’t cool off until after midnight. Again, no more as the air mover does a brilliant job of pushing cool air from in the house, through the garage and out the front. Brilliant tool. Why the hell didn’t I get one years ago?! I picked up the one at left from Home Depot for $199 (7/17/2010). @Ian: We have an attic fan in Missouri, too, but it tends to pull ash out of the fireplace(!!). Of course, an Eichler has neither an attic or a crawl space…. @Philippe: Push air into the house, though I’ll sometimes set it up to pull air through the house, too. As far as pushing dust in the house is concerned, we leave the doors open anyway. There aren’t really very many bugs in California (save for swarms of June Bugs this year) and the dust doesn’t seem any worse with the fan on (i.e. it is still quite dusty around here). If you are lucky enough to have a gas range, you already know the joys of a dead even heat source that can range from medium-low to blowtorch. None of that cyclic all-on/all-off nonsense of the typical electric range, for example. However, “low heat” is not something in the typical gas range’s vocabulary. On our Viking, the lowest setting on the smallest burner will keep a small pot of water at a rolling boil and will consistently cause a cup of rice to boil over. And it is a really low flame! Enter the heat diffuser . A heat diffuser sits between burner and your pan or pot. It effectively acts as a heat buffer and, as the name implies, diffuser. On a gas range like mine, it allows one to achieve the lowest simmer/heat you might want. On an electric range, a cast iron heat diffuser — you want thermal mass — will nicely even on the all-on/all-off behavior of most ranges. At ~$20, it is a worthy tool to add to your cooking arsenal! Just found yet another use for my turkey burner. Roasting chile peppers! Worked flawlessly and was a heck of a lot easier than a plumber’s torch. This kind of gas burner is just incredibly useful for anyone who enjoys cooking. It is designed to be able to heat a pot of grease up to the 350°F necessary to deep fry a turkey (which I have never tried). Thus, the burners put out a truly awesome amount of heat! Note: The Underwriter’s Laboratory will not certify turkey fryers at all. Why? Because people are stupid and need to be protected from themselves when using powerful tools. When frying, it is terribly easy to cause a grease fire. So, fry away from your house and use the nifty good-eats style turkey crane. And have a grease friendly fire extinguisher on hand. Or just do what I do and don’t actually fry turkeys on it! The top of the burner should be flat. This is critical if you want to put something on it that is burgerbigger than the burner (like a grill). Yes, I was hungry when I wrote this. The burner, itself, should be two pieces of cast iron held together by a bolt through the middle. The burner will get stuff spilled on it and it will rust or corrode. The two piece design makes it trivial to take it apart for cleaning. 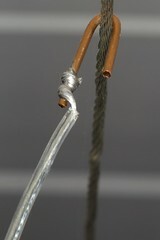 A wire brush on an electric drill makes cleaning trivial. This is needed to be able to tune the flame. Not just for maximum heat output, but sometimes also for maximum flame height. The gas coming out of the tank is relatively high pressure. The burner’s secondary regulator will take care of regulating down to something more reasonable. The valve after or integrated into the regulator is critical because the pressure off the tank, while high, will change considerably as the tank empties. That and it is nearly impossible to make fine adjustments on the high pressure side of the line. If you get a kit, try to find one with a stainless steel pot. It will last longer and corrode less than aluminum. Some burners have legs that go straight down or are relatively tall. Stupid. Ideally, you want a three or four legged burner with relatively wide set legs. If three legs, they should spread quite wide for stability (like the one to the left). 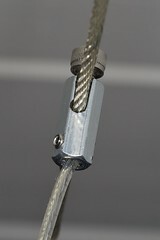 While making my own low voltage cable light fixtures, I searched high and low for a little piece of hardware that would elegantly connect between the suspension cables and the wires down to the lights. No luck. Everyone wants to sell you a cable lighting kit or, at best, the only “parts” are $40 bare MR-16 halogen lamp fixtures. No thanks. Until I could figure out a solution, I simply bent a few bits of heavy gauge copper wire and made hangers like the one at right. It worked OK, but clearly needed to be replaced with a real solution. Spend less than $10 on parts and make my own connectors. Well, $10 on parts and $225 on the tools necessary to solve this particular problem. What follows is a description of the tools and some photos of the various stages. If you have even the remotest amount of metal working experience, there’ll be nothing new here (and probably lots of opportunities to make fun of me). But, as pictured at left, I achieved success! We do get weather in California. Beyond the 9 months of sun, we have 3 months of sun and rain. And, believe it or not, cold weather. It actually freezes quite a few times over the winter. And when you live in a glass house with a gigantic hole in the middle, this can make for a few wet and chilly days. 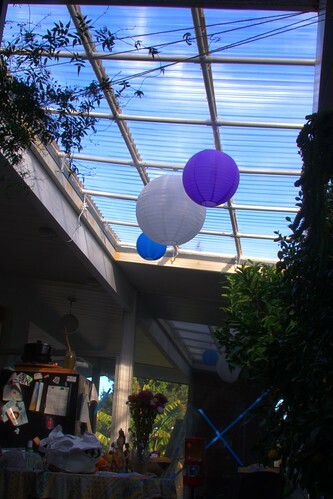 To compound the issue, we are in the midst of a remodel and, thus, our kitchen is actually in our atrium. We cook, eat, and refrigerate in this open space. In past years, I have tied a tarp over the hole. It worked, but was ugly and leaky. Clearly, a better solution was in order. Many of the Eichler’s in our neighborhood have covers, but most are permanent — intentional or otherwise due to the inconvenience of dealing with it. When I searched for “eichler atrium cover“, the first non “network” hit was this beauty. Well engineered and stylish, but unintentionally permanent. Coincidentally, that cover was built by Robert Bowdidge, a rather smart fellow that I used to work with at Apple. So, we took a wander about Home Depot to peruse all of the materials that might be suitable. Off the bat, I chose Suntuf corrugated lexan panels as the actual covering material. It is lightweight, very strong, and reasonably priced. Suntuf blocks almost all UV radiation. Let me be frank: Circular saws scare the bejeezus out of me. Always have. Rotating blades of doom ready to swallow a finger in barely a heart beat, technology be damned (very very cool technology). As we are in the midst of a remodel where the goal is to recycle as much as possible, it was high time for me to get over this silly fear and get a damned chop saw. One of our goals is to recycle whatever we can. In particular, recycling he kitchen cabinetry and turn them into cabinets in the garage. Now, garage floors slope. And garages typically have a 4″ to 6″ sill of concrete on the outside walls. Both of which would require cutting various 2x4s to the right sizes/lengths to build new legs for the cabinets to have them be both level and flush with the wall. And there is about a zillion other little projects around the house that will require custom bits of framing. Shelves. A cover for our atrium. Repairing the Big Green Egg table. So, I picked up a basic Craftsman Compound Miter Saw. But it required a table. 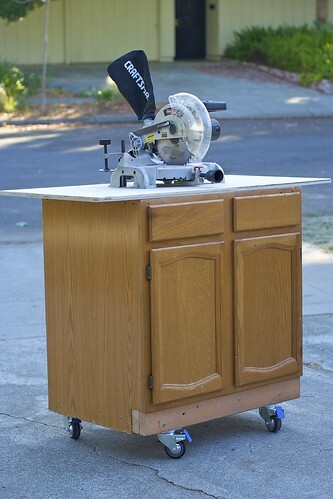 Initial use indicated that screwing it down to a plank on top of a kitchen cabinet works great, so why not turn one of the recycled kitchen cabinets into a roll-around saw table with built in storage? Easy enough. That is exactly what I did. Better yet, only the 24″x48″ work surface is new. Everything else is recycled.